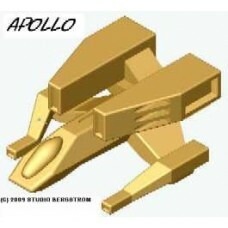 The Apollo heavy interceptor has enough power to get it out of trouble as fast as it can get into it. These fighters do best in pairs when capitol ships need softening up before the missiles and bombs fly! These help take out area defenses so the big boys can get in close enough for damage sake, and if a few fighters get in the way of their fire then all the better! 3/8”L x 5/16”W x ¼”H (9.5mm x 8mm x 6mm), this 2 pack comes with pins and 1/2" Versi-Base (tm).